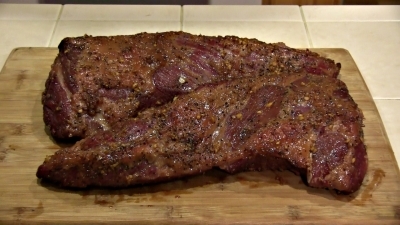 SmokingPit.com - Sweet Sesame & Soy Marinated Beef Tri tip Roasts - Slow cooked on a Yoder YS640 Pellet grill. This recipe will take Tri tip to the next level! Rinse, dry and trim two two. Tri-Tip Roasts. Here's a tip... Ask your local grocers meat cutters to cut you two tri tip roasts and have them trim off most of the fat and save money. We will start with the marinade. 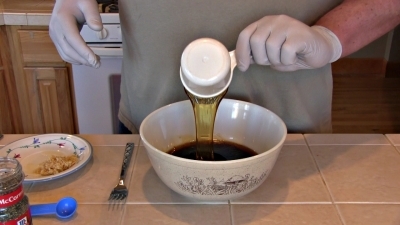 In a medium mixing bowl combine 1 cup honey, 1 cup reduced sodium soy sauce, 3/4 cup sesame seed oil, 1 cup honey, 1 tbsp minced garlic and 1 tsp coarse ground black pepper. Thoroughly mix the ingredients. 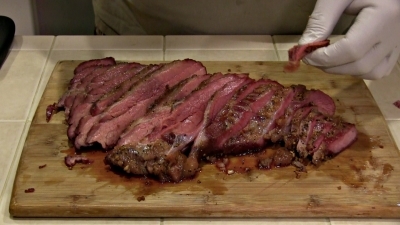 Place each tri tip roast into a one gallon Ziploc bag. Pour 1/2 the marinade into each bag. Squeeze out as much air as possible and seal each bag. 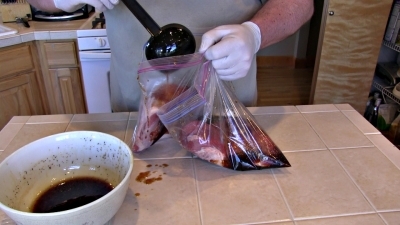 Place both bags into the fridge and marinate for 6 to 8 hours. Make sure to turn or flip the bags a couple times during the marinating process. Once the meat has marinated, it's time to pre-heat your cooker and prepare the meat. Pre-heat your cooker to 225 degrees. In this cook I used hickory wood pellets. Chop 6 to 8 cloves of garlic. Spread 1/2 the chopped garlic over your cutting board in an area twice the size of a roast. Shake on an even amount of coarse ground black pepper. Lay the 1st roast on top of the seasoning and press down firmly. The seasoning will embed itself in to the outside of the roast. Flip the roast and repeat on a section of the cutting board that has not been used. You want a nice even coat of the seasoning. 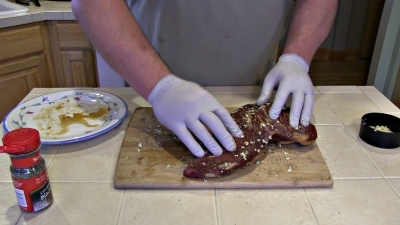 Apply a second coat of the garlic and pepper to the cutting board and repeat the steps coating the 2nd tri tip roast. Place the roasts in your cooker and cook @ 225 degrees until the internal temp reaches 130 - 135 degrees. 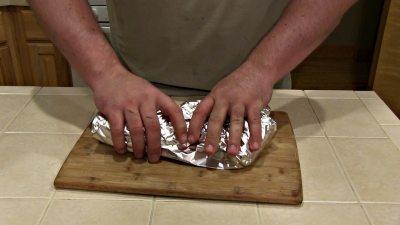 When the roasts reach this temp, pull them from the cooker and wrap them in foil immediately. Let them rest at least 45 minutes for the juices to re-distribute. Once the roasts have rested, un-wrap them and slice them against the grain of the meat. This will produce thin slices of meat that are very easy to bite through and chew. The roasts should be pink and juicy. Enjoy! Hickory wood or pellets are recommended for this cook.